There are not many examples of Greek films from the 60s that involve Vangelis that have been officially released. It is a pity, because there are a few Vangelis-scored Greek films from that era just sitting on the shelf somewhere, deteriorating. 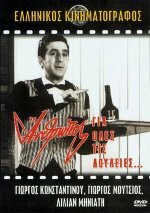 This Greek film from the 60s, Man For All the Doings, is not scored by Vangelis either. It is actually scored by George Theodosiadis. The reason it is listed is because Vangelis does perform for one track in the score of this film with Theodosiadis (information about the score can be read by clicking here). This DVD is currently in print in Greece, but is not the easiest title to find. 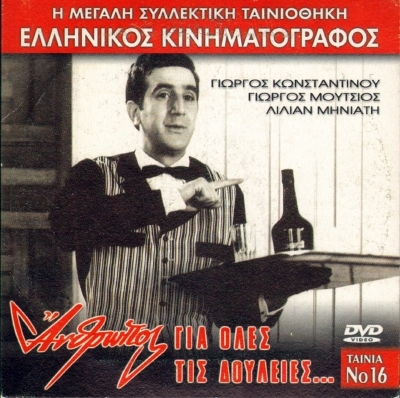 It can be ordered from Greek City Video in Canada (click here), but be aware that it is, in fact, a Region 2 DVD and in PAL. As to the film, it is rather light comedic fare about one man's life lesson regarding money and relationships. Unhappy with working in the family shipyard business, he decides to drop out and work as a waiter at the most upscale hotel in Athens. Once there, he will cozy up to guests and use them and their information to make his own fortunes. Problem is, he gets personally involved with the individuals he meets and ends up helping them with their own personal problems. He realizes that he will not find what he thinks he is looking for and returns to the family business and the hot secretary and lives happily ever after. and yes, the Vangelis track, "Espial Corridor", is used in the film during a scene where he is spying on a guest in the hotel. I would also suggest that Vangelis' skills are used in another scene where the one guest, a wheelchair-bound woman, is having a flashback about her failed suicide attempt. The scene is brief, but the music is dark and reminds me of "Espial Corridor". I have no way to confirm this is true. The "Espial Corridor" track is not any longer in the film compared to the CD.